Today is a wonderful and celebratory day as we welcome a new life (a baby girl!) in our lunching family! How this will affect the daily lunch and dessert posts for the next 6 weeks or so is yet unknown. I will try my bestest to upkeep our lunching ladies routine. However, holding the fort down solo will be time consuming, and without the other half to share entrees, and desserts in particular, lunching as usual will be challenging digestively as well as economically. We push each other daily to take a time out, and make it a part of our work day to eat together, so her presence will be greatly missed, but a joyous day it is indeed! What are kinako mochi? I've only seen mochi in spherical shapes with ice cream, fruity or red bean paste fillings. "Mochi" is a generic term for rice cakes (and sometimes not even made with rice or rice flour) and come in different shapes and forms and textures. Can be eaten savory or sweet, grilled, raw, etc. 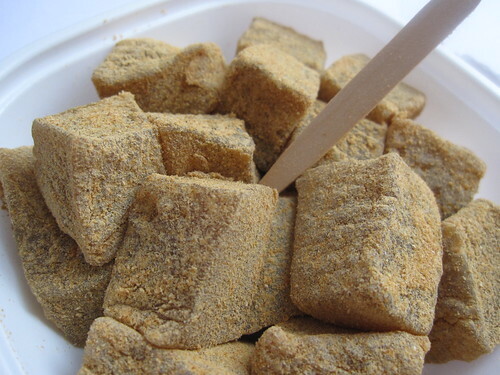 "Kinako" is a toasted soybean powder that when used in a dessert is typically mixed with a bit of sugar. Nutty and delicious! If you've ever had soy butter (sold next to peanut butter in health food stores), it tastes like that. Congratulations on the new lady in the family! May she have a wonderful taste palate and enjoy the foods you do! Congratulations on the new arrival! Parenthood is both an adventure and a challenge. If you instill your child with your love of life and the variety of experiences therein, I feel sure that she will become a well-rounded, thoughtful person like both of you are. Best of wishes from your Alabama "friend." Good luck on the workload, too. Holding down the fort is never easy. Congratulations on the new bambina!